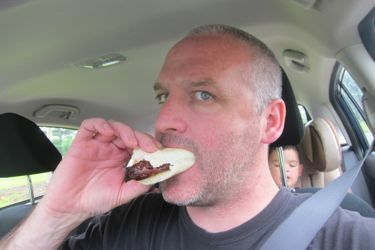 It has been a couple years since I’ve been able to enjoy a new Roadfood “Eat Before You Die” entry. Oh sure, I’ve had plenty of repeat items over that time, but no new ones. So when I figured I could scoot out to Stevenson – part of Monroe that refuses to call itself Monroe – I got a little excited. This experience would get me one step closer to the completion of this fairly large list of rather unhealthy food choices. I was out on an adventure with my boys; from Wallingford (where we, coincidentally, stopped at Neil’s Donuts which is also on this Roadfood list) to Cheshire (hike) to Oxford (brewery) to Monroe- er, Stevenson. You know, another typical Saturday in CTMQ–land. Honestly, we like the hot dogs more than the burgers. Zoar offers regular and foot-long Hummels cooked to taut, pink goodness and topped with whatever you like. Our foot long with “the works” was buried under onions, sauerkraut, mustard, and relish. Of course, bacon and cheese are also available. 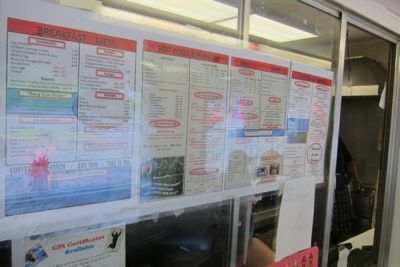 The Zoar Drive-In, which is open seven days serves breakfast every day. Although it is casual and cheap, it is NOT particularly fast food, as everything is made to order. Waiting is part of the experience, and all the day’s local papers are spread out on the counter for customers to enjoy while their food is cooked or while they eat it. For us, this is an amiable place, but in a ramshackle way. 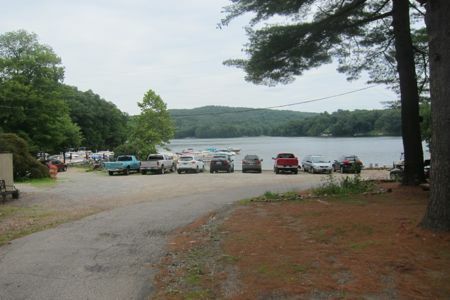 It is located on Lake Zoar, which is a beautiful setting; but the view from both the picnic tables and the parking lot is pretty well blocked, and the restaurant itself is very well worn. The ambience we like about this drive-in is less about natural beauty than about the charm of a roadside burger joint that takes pride in what it does. Even so, as Roadfood notes above, this place is still slow. 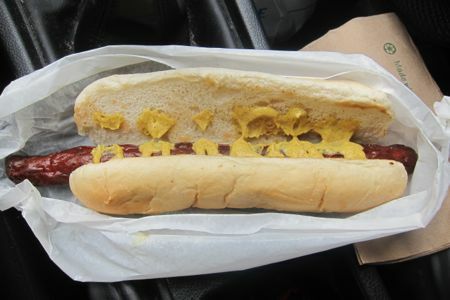 I only ordered the pre-determined foot-long hot dog with mustard and had to wait about 10 minutes. I can’t imagine how slow this tiny little shack (said with affection) during a busy dinner service. My word. One bonus (?) 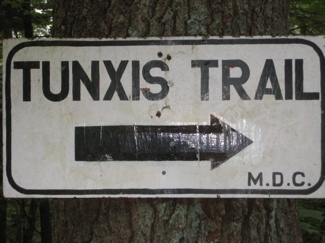 of the Drive-In is that you can park in very near it and access the Paugussett Trail via the spur that comes down to Route 34. There’s no hike quite like a hot dog fueled hike. The interior of this place is super, super tiny. Absurdly so. Honestly, no joke, I can’t see how the upper end of the obese demographic could even get inside to order. The young man who completed my hot dog and handed it to me was super polite and friendly. I think that’s a big thing here, and that’s pretty refreshing. One foot-long hot dog, down my gullet. It was fried, so the snap and char of the skin was quite wonderful. These Hummels are very skinny, but full of flavor. The standard bun was soft and warm. Bottom line: it’s hard to make a delicious giant hot dog, but it’s easy to screw up. Lake Zoar Drive-In had all the elements dialed in and I rather enjoyed eating it while driving up through Newtown to I-84 and onward towards home.